It has been a good year, this first year of my retirement. A lot of very interesting things have happened, and most importantly there has been time to explore them. You have to have time to watch sunsets and sunrises, and there have been many river sunrises of note, and sunsets too. 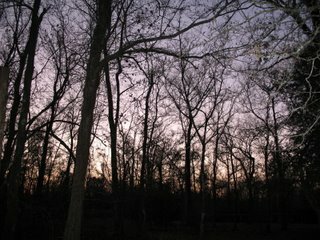 This picture is sunrise this morning, but showing the western sky for a change. 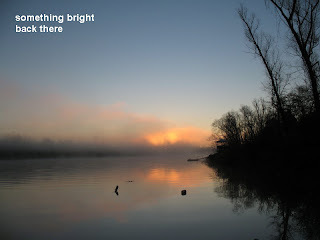 Looking back, I see that I have posted 136 things to Riverlogue since December 13, 2005. 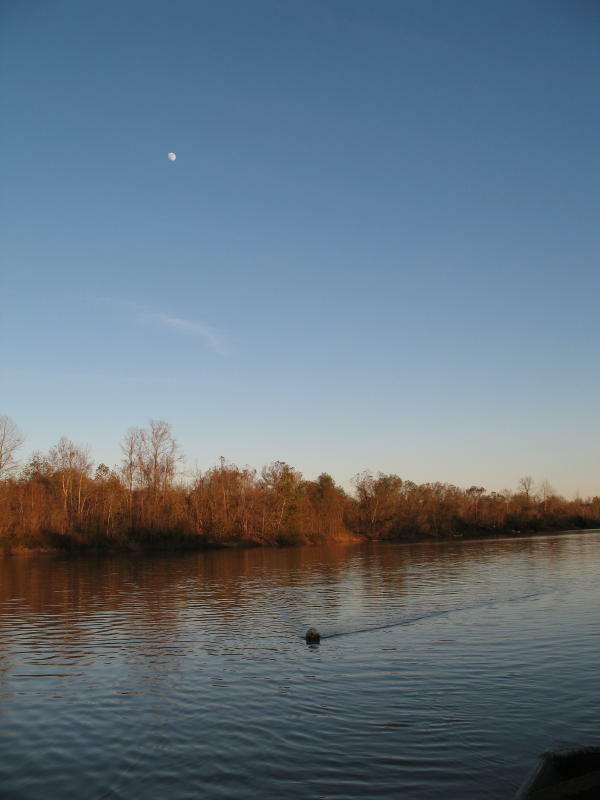 The first things were small paragraphs of text that talked about what the days were like here on the banks of the Atchafalaya River. As time went by, I found that I could place pictures into the postings and that added a new dimension. Other things could be done to the blog but I think, for the time being, it works well enough. During the last year people have visited this site 6035 times, and through comments they have made I have met people from numerous places in the US as well as other countries in the English-speaking world. People in California ask about Napoleon (birdwatching at the window), and people in England read about the boat project we did and comment about boat making of a similar type in their country. It has truly been a mind-expanding endeavor and enjoyable. The river has had an unusual year this year. What should normally have been a high water season in the spring never took place. And so we have had about 20 months of low-volume flow, unbroken by a strong flushing event. I guess this just puts some extra accent to the saying that there is no such thing as a normal water year. We shall see. One of the unusual things that seems to have happened is the number of salt water species of fish that came all the way up here to Butte La Rose, a long way from salt water. We saw sheepshead, hardhead catfish, gafftop catfish, redfish and tarpon along with the more expected species like flounder and bull shark. I just don’t think of sheepshead swimming under my dock, I just don’t. But thanks to friendly hoopnet fishermen like Rusty Kimball I got to see these fish. And we had a summer of being able to catch blue crabs right here at the I10 bridge. What a great surprise, and man they were so good fresh from the river like that! One of the very interesting things that time allowed this year was the volunteer work that I do with the state archaeologists. Being a vertebrate zoologist I like to mess with bones, especially t rying to identify an animal from a single bone, or even a fragment of one. 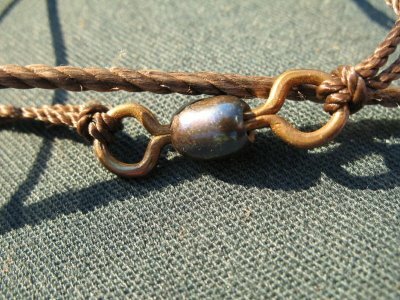 This activity seems to be useful to archaeologists trying to discover information about Native Americans, information dealing with the sites they occupied and the habits they had, including what they ate. And it turns out that from the bones left in the middens at the sites you can tell something about food habits of the people who ate the animals 2000 years ago. It is fun for me, and seemingly useful to science too – a nice combination. The bone in the picture is related to this in that a friend of mine, Steve Shively, sent me the picture asking for identification if possible. 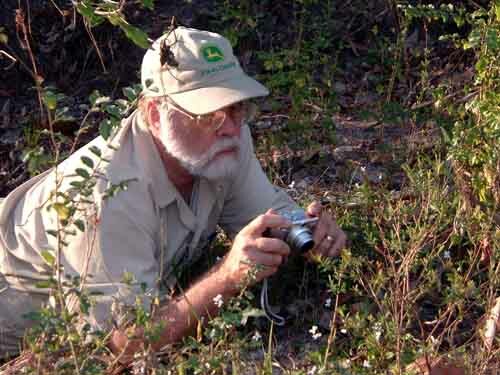 He found the bone beneath an eagle’s nest that he was studying. I confirmed with him that it was a catfish skull. I do the same thing for many of the bones that have lain underground for many centuries. The people you meet who do this kind of thing are interesting too. Another thing that time allows is photographing the things that live here along the river, in the place where we live. The inch-long spider lives on our back porch. 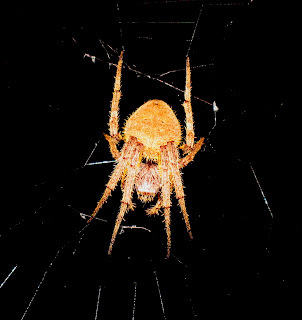 The books call it a barn spider of the genus Neoscona, an orb weaver. It comes out just after sunset every night (when not too cold) and builds this big web, then waits for food to just fly in. 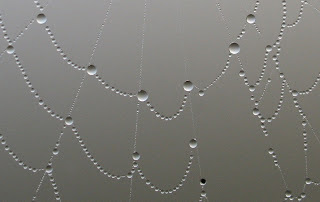 When daylight comes, it “harvests” the web and by sunup there is no web left. I have many other images now of life at Butte La Rose, particularly flowers and invertebrates. Birds take a little more equipment than I have, or want, at least for now. Just a note about the rain we just had, and a couple of the consequences. We got about six inches here, mostly in about five hours from daylight to noon. There was a lot of standing water, and it filled up the ditches and the big borrow pits along the levee. The frogs are having a really good time out there in that new water! The peepers and chorus frogs are making the nights come alive with the loud announcements of their not-so-honorable intentions toward any friendly female frog that comes within reach. I like to just ride down the road with the windows open so that I can listen to the choruses. All this looks good for the upcoming Louisiana Amphibian Monitoring Program. The survey season starts January 1, with three surveys spaced out over the succeeding six months. The other consequence of the heavy rains is the rising river. We got about a foot rise very quickly after the rains yesterday. This comes just at the time when the upper Mississippi and Ohio are also feeling the swell of new water in their watersheds, the crest of this rise has made it all the way to Memphis already. But both rivers show lowering water above Memphis. The Atchafalaya River is at 8.0 feet on the Butte La Rose gauge right now, rising to 13.5 feet by Friday, and that’s a pretty hefty rise in a week! The net fishermen will have to move a lot of nets before that water gets here. But they know this. Being aware of the subtle signs of seasonal change is not that difficult for those who spend a lot of time outside. We know what is happening around us without really paying attention. We even become able to predict what will happen soon based on the time of year and our experience – not always accurately, but we try. So we expect it to be humid in the summer and less so in the winter. It will rain more regularly in the summer and more sporadically in the winter as the fronts make their way over us. Late fronts in the spring will be preceded by strong southerly winds. Most of the time we just operate with that kind of background information guiding us, and most of the time we don’t know we do it. But one of the most significant occurrences in this part of this world of ours goes unnoticed by many– the winter solstice. The solstice, the shortest day of the year, takes place on December 21 or 22. And it marks the calendar beginning of winter, although most of the time you can’t depend on having cold weather in December. What does that day mean to us? Well, it used to have a profound meaning for our ancestors. When people’s lives depended on knowledge of the way the natural world worked, it mattered. And people were very aware that the days progressively became shorter and shorter in the fall, and shorter still in November and December. And there was a thought, way back long ago, that if that kept up, days might just keep getting shorter and eventually the sun might just go away and not ever come back. It seems silly to us now, but to the people who lived and died by the natural cycles, our actual, direct ancestors, the presence of the sun was not a trivial matter. They did not sense the guarantee that we take for granted. So, they noted that on a certain day, almost as a gift of unknown deities, the sun began to stay with them a little longer as the days progressed. It might be cold, and difficult to get food and stay comfortable, but the sun was coming back and that was cause for celebration. This celebration took the form of rituals performed each year on the longest night of the shortest day. The rituals all involved the use of fire as a symbol of the light that the sun brought with it. The rituals had many forms and came to be thought of as necessary to the return of the sun. And so, even though we have progressed beyond the simple beliefs of our long-ago forebears, many people today have found the strange calmness that comes from paying attention to the Winter Solstice. There is a feeling of having plugged into an ancient mindfulness that comes with lighting a fire on the longest night. I am glad that we are not so modern that we have forgotten the hard-earned practices of our ancestors. We don’t need their predictions of hard winters or long droughts or other climate-related features of our environment to survive now. But we are a part of their heritage, like it or not, and the good feeling that comes with saying “Yes, I acknowledge you” to the Winter Solstice is proof of that. After many years of doing a solstice celebration on our own, we chose to join others on the longest night this year. It was good, and it produced the good feelings I spoke of above. Sharing with others can be a significant part of the celebration. I thought I would note the conditions present on the first day of winter at Butte La Rose. 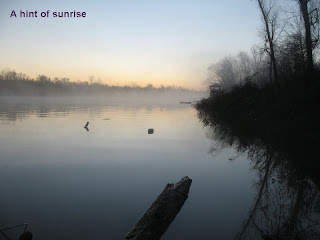 The three sunrise pics were done to remind me of the newness and wonder of the returning sun, from a faint glow in the east, to a bold gold spot on the horizon, to the full blast of the sun itself bursting over the river. At sunrise the temperature was 40 degrees, there was a light east wind, and it was partly cloudy. A couple journal notes. The rain we had the last couple days has kicked the winter frog species into high gear. And the continuing rain we had today will make them even more convinced that the time is ripe for love in the ditches. The spring peepers, chorus frogs and southern leopard frogs are romancing as we sleep. And fish. Rusty Kimball donated a couple fish to me yesterday – a striped bass and a barfish. Pic is included here. Our granddaughter Elena ate a lot of the striper and she is only 18 months old. But cleaning the striper wasn’t a job I will take lightly the next time. It weighed about six pounds and I chose to skin it, scales and all. After I filleted it, I had to remove all the red meat along the lateral line. That is not something you can do with a dull knife. I keep my knives sharp but that was a test, even for them. I pan-fried the fish and it was excellent. For those who wonder, Napoleon is well. He looks at the fish on the dock with expectation. He usually gets some. The river is at 5.5 feet on the Butte La Rose gauge, and the chart says it will stay that way for several days, but it won’t. The heavy rains we have had will cause it to come up a few inches starting today. The Ohio and Mississippi are both rising and we will get some of that water. There is a lot to learn about fishing in Louisiana, especially if you choose to try to make a living at it. When I decided to try to do that I didn’t understand how absolutely naïve I was. I mean commercial fishing, not tournament fishing (although that takes skills of another type). But what a wonderful thing to learn, especially if you have friends who don’t mind teaching you. The people of the Myette Pt. 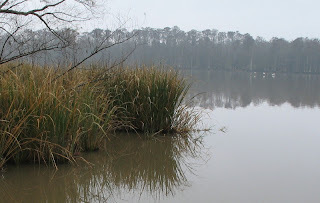 community (now Oxford), near Franklin, have made a living line-fishing for catfish in the Atchafalaya Basin for at least four generations – extending back to the mid 1800s, and beyond. The manuscript I have partially written about commercial fishing describes the techniques used by that community of line-fishermen in the Basin. The amount of information available on just the seemingly simple process of line-fishing is truly amazing, and just the outline of topics presented in the table of contents is two pages long. One of the major topics in the manuscript is the one describing the bait used to catch catfish. As I mentioned in a posting before, you can’t make a living line-fishing if you buy bait. You simply need too much of it, so you have to learn how to catch the bait you need – both the type and the quantity. The type varies with a lot of things, mostly dealing with the conditions present in the river. 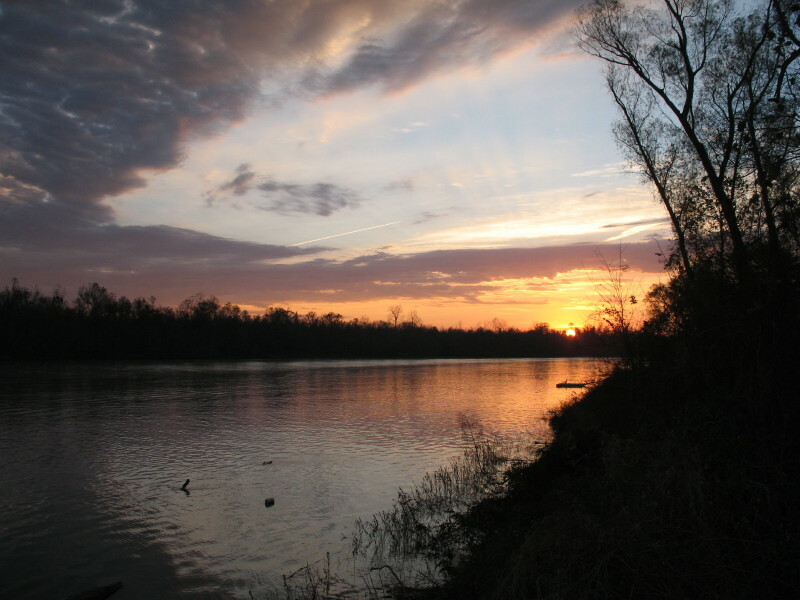 The water can be high or low, falling or rising or standing, cloudy or clear, Red River or Mississippi or Ouachita influenced, cold or warm and other factors that would make this sentence much to long. Each of these things causes a decision to be made concerning bait. 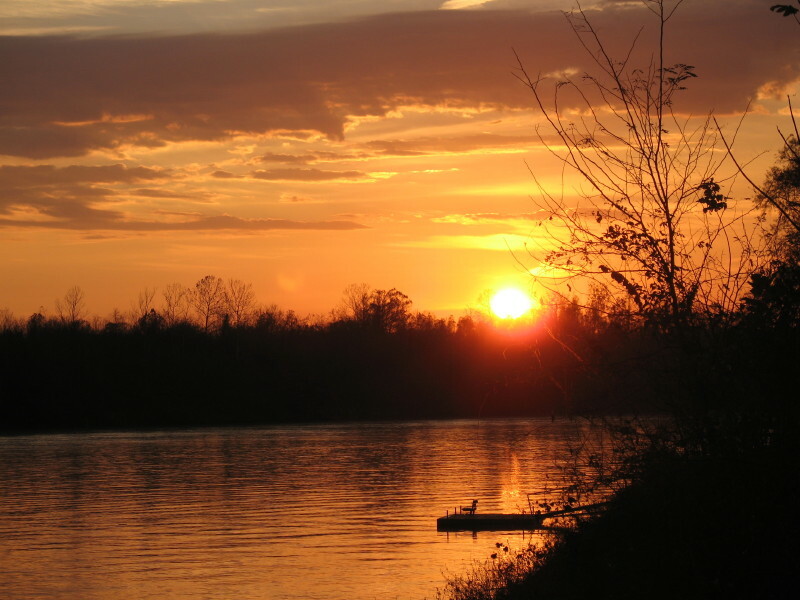 Some of the types to be learned are river shrimp (by far the most often used bait), small crawfish, cut shad (big ones), cut mullet, string shad (small ones), the big eels that are familiar to most of us, and the topic of this posting – white eels. Each one of these baits has its own biology to learn before you can become good at catching quantities of it. Because of this, the people that come from Myette Pt. know more biology than most college graduates, at least when it comes to the animals and plants that they interact with. And that leads us to the white eel. I first heard of this animal the second year I fished with the fishermen from Myette Pt. Someone asked me if I was going to catch some white eels. I had no idea what they were talking about but it turned out to be a fun thing to do. The scientific name of this animal is Myrophis punctatus, and the recognized common name is speckled worm eel. It belongs to the same family as our more familiar American eel. It occurs in warm waters of the Atlantic, Gulf of Mexico and Caribbean. The life history involves a migration reminiscent of the American eel, but not so extensive. Unlike the American eel, it doesn't travel thousands of miles, but apparently the worm eel does move from fresh water to coastal brackish waters to salt water to lay eggs. But there is an interesting observation here. The fishermen at Myette Pt. know that this animal grows to adulthood in freshwater lakes in Louisiana, namely lakes Verret, Grassy, Palourde, Fausse Pointe, Dauterive and probably others unknown to me. It seems that science is unaware of this. The books don’t talk at all about this animal living in fresh water for much of its life cycle, but it does. Just ask the fishermen. In a practical sense, the white eel is the best catfish bait that can be used in the Atchafalaya Basin in the fall months. They are between eight and 12 inches long when they leave the lakes, and about as big around as a fat pencil. To get them, you wait until the first cool front comes down from the north, not cold necessarily, cool is good enough. The first night that the north wind blows, you need to put your boat in the water and go to a place where the big lakes narrow down to some outlet headed toward the Gulf. Such a place is the outlet from Lake Fausse Pointe on the south end. If you anchor in the mouth of that bayou and stand with a light in the front of your boat you will see hundreds of these little eels coming toward you, swimming on the surface. With a small-mesh net on a long handle you can catch as many as you want. How many you want may be determined by how cold the cold front is. Once you have them, they have to be treated like other fish, that is, kept wet with oxygen to breathe. In the old days, everyone had an old pirogue or bateau on the ground in their yard and the eels were put in there with water and a covering of water hyacinths. They would stay alive for weeks under those conditions, sometimes longer. To use the eels for bait, they are cut into small pieces – ½ inch will do. 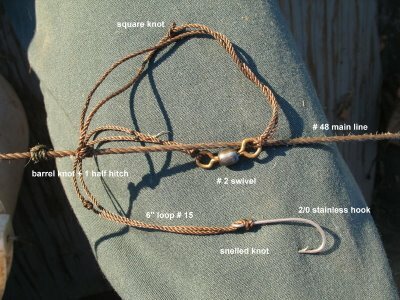 A piece is put on each hook. Lines that produced only a few fish the day before will produce a lot of fish after baiting with white eel. As a matter of fact, sometimes so many fish are caught within the first few days that the lines have to be moved to areas with new fish populations to fish for. The eel bait will have cleaned out the fish in the previous location. Hard to believe, but I have seen it happen. Only those eels that can be kept alive until used are effective bait. If you freeze them in an effort of keep them available longer, they don’t work. Speculation about this includes the thought that freezing removes the slime and somehow the slime is what makes the bait so effective. And because of the slime, some people mix the pieces of eel with cornmeal to make them easier to hold onto. So, last week I had the chance to visit Larry Couvillier in Charenton and he had a bunch of the white eels in a big aquarium. Larry was taught to catch white eels by his father, Edward Couvillier. An aquarium was set up with air bubbling through the water and that seemed to keep the eels alive and happy. Apparently the normal thing for them to do is to dig into the soft mud bottoms and stick just their heads out of the mud. They were trying to do that in the aquarium and some did it even though the gravel was a little harder to dig into. I was able to take some unusual pictures of the eels in the water, and burrowed down in the gravel, as opposed to out of the water being held in someone’s hand. Anyway, the white eel, or spotted worm eel, Myrophis punctatus, is out there to be had by anyone adventurous enough to go out to the right place on a cold night in the north wind. It can be a fun thing to do. The river is at 5.4 feet on the Butte La Rose gauge, falling to 5.2 in next couple days. Both the Ohio and Mississippi are falling all the way up. That might change after this week. A lot of rain predicted up there. That’s what fog gives us, sometimes. And because we can’t see so far in the fog, we get a chance to look around at what is close at hand, really look. And we get to be alone and look. On a clear day, it seems that you have to share the world with everyone else, but on a foggy day the world seem s to belong to you and just you. I find it is useful time, the time to spend alone in the fog and look closely at the world that is around me every day but not seen. And it is easy to reflect on a foggy day. The two small pict ures are kind of a technical-interest thing. One is the moon on a morning in the fog, and the other is the same scene but with the flash active on the camera. The light is reflected on the millions of water droplets that are themselves what fog is made of. The effect is interesting, I think. The other pictures are some I took yesterday on a trip down the levee to Myette Pt. I stopped at Grand Avoille Cove, just south of Lake Fausse Pointe State Park. The fog was still hanging over the swamp at mid-morning and the feeling of soft beauty just kind of reached out and pulled the camera from my pocket and called the pictures forth. 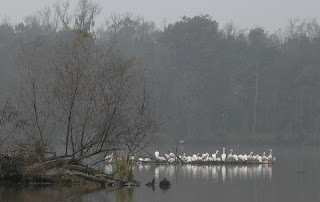 The presence of white pelicans resting out in the middle of the cove didn’t hurt the ambiance at all. A couple days ago, the fog was still thick over the river at 11:30 in the morning. Looking out at that scene made me remember times when the fog had a direct effect on life in Louisiana, more so than now. When I first started my college career (and sometimes it seems to have been a career) in 1959 it was easy enough to get through the freshman year, maybe, I guess, because it was a new thing and interesting. But as time passed, the call of the swamp pulled me away from Lafayette and I spent more time with the cypress trees than I did with Comparative Anatomy. As I lowered my grade point average, USL chose to invite me to spend a semester or two in reflection, and they suggested I might try again later. There is fog in this story, I promise. Recognizing that some form of gainful employment was expected by my parents, I hired out to a pipeline crew working in shallow offshore waters – actually it was Eugene Island, for those who recognize the name. We would leave New Iberia at 5:00 am every day and drive in a crew truck to Morgan City where we would get onto a crewboat for the long ride down the Atchafalaya out into the forest of Christmas trees in Atchafalaya Bay. Once there, we would work all day on a barge connecting pipe to recently drilled wells and running the pipe to a collection facility, like a tank platform or something like that. 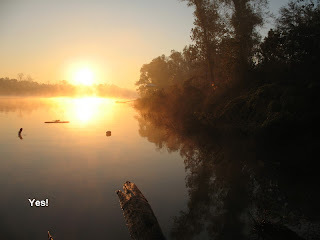 The trick to all this, and where the fog comes in, was getting the boat from Morgan City to Atchafalaya Bay. Some days it was OK, but some days it was like it has been around here the last few days, but much worse. We would get onto the crewboat and start down the river, and without warning there would suddenly be fog everywhere. Not the kind of fog that is considered bad when you can only see a few hundred feet, but the kind that makes you wonder where the world went. You can see your hand, but not someone else’s ten feet away. I don’t know if I’ve seen fog that thick lately. Fog like that used to make us happy if we were driving on a road that had a stripe on the RIGHT side so that we could tell where the shoulder, and the rest of the road, was. Anyway, here we are on a crewboat with a driver suddenly gone blind. Why not turn on his radar, you say? There was no radar on most boats in those days, certainly not on thirty-foot crewboats delivering a bunch of welders and such to a low-paying job in the bay. So, what to do. If we were lucky we would find a bouy in the channel and tie up to it to wait out the fog. Sometimes it would dissipate after a couple hours, but sometimes it would not, and we played boure for long periods of time. One other thing that has stayed with me about that time is sleeping so soundly on the boat when it was moving to the job or back from it. It was the sound of the engines. When two diesel engines (gasoline too, I guess) are running close to the same RPMs, they make a steady THRUMMMMMMMM sound. But, when the engines are slightly out of phase with each other, they go THRUMMTHRUMMTHRUMM, and because the engines on that boat were always out of phase, nothing can put me to sleep faster than that sound, even now. The job we did was hard work. It was hot and cold, and rainy and dry. It was seldom comfortable. The work was physically hard since there was no way to move the 3” pipe sections around except by hand. Men who could move the pipe easily were much respected. I was not in that league. We were all afraid of the portable X-ray machine that was used to test each weld before that piece of pipe was lowered into the water. We believed that the rays would sterilize anyone close enough to be affected and you could only get so far away from the machine on a barge. When the machine came out, the far end of the barge got very popular. Yes, hard work, and a hard life for those who had to do it. It took me about a semester to decide that maybe there was room in my life for both the Atchafalaya Basin and a college degree. And so I went back to USL and managed to get through a Biology curriculum. I did learn many years later that the owner of the pipeline company, who knew my family pretty well, had told the other guys on the crew to make sure that I would be going back to college. No wonder I always seemed to be in the right place just in time to get the worst jobs. And I’ll bet that X-ray machine really wasn’t that dangerous. And I’ll bet anyone would have lost all that money at boure. I was just really unlucky at cards – or maybe not. The river is at 5.8 feet on the Butte La Rose gauge, falling to 5.5 over the next few days. The Ohio and Mississippi are both falling all the way up. No water for us there. It must be hunting season. All these people come to the river in their bright orange Mardi Gras costumes and c limb into floats (in the truest sense) and drive across the river. They disappear into the forest and sometimes they make banging noises, though not very often. Yep, it must be hunting season. Speaking of hunting, sort of, we had a visit from the people doing the Butte La Rose Christmas Bird Count today. For the uninitiated, that’s the once-a-year-at-Christmas bird count that is done all over North America, and some in Central and South America as well. The result tells scientists where the birds are and how many of them there are after migration has settled down for the year. That’s why it’s done in the winter. It’s fun to do and anyone can do it. I will take part in the Lafayette one between the holidays. The folks that came today (Mike, James, James and two Virginia visitors) managed to see and record 101 species of birds during the time they were doing the count – pretty much predawn to darkness. I guess that’s one reason why people take such an interest in birding, there is such a variety out there to see. With all the fog the last few days, there have been interesting effects created at the river. The fog produces uncommon amounts of dew on everything that it adheres to. The spider web hanging from the dock catches your eye as it shimmers in the slightest breeze. If you enlarge that picture you get the wonderful effect of gems strung on a silver thread, as the image included here suggests. And then there is the feather drifting on a raft of very many very small things. Again, the dew on the feather has a gemlike quality, almost like clear pearls. Reminder, click on the image to enlarge it. Frogs. If we had been having enough rain to put some water in the ditches, etc., we would be having three species of frogs doing their best right now to spread the word that frog breeding season is open for business. But no water, no business. I have heard a couple spring peepers calling from the trees, sort of like warm up calling. No enthusiasm. We need rain, a good bit of it. The river is at 6.5 feet on the Butte La Rose gauge, falling slowly to 6.1 feet by Wednesday. The upper Mississippi is rising a little, but the Ohio, where our water mostly comes from, is falling. How fast does it change from warm to winter? As fast as it takes to go from green to brown. Last week our yard and the river banks were green and full of flowers that the hummingbirds used a lot. This week, after the cold last Friday, the flowers are all gone and the only hummer food out there is the food we supply in feeders. And the buff-bellied hummingbird that has visited us each winter for the last few years is still here and living on sugarwater. The yard is really stark. The trees framed against the sunset talk in the breeze as if they know the sap they need is stored underground, kind of like they hibernate. It has become cold and they don’t care. 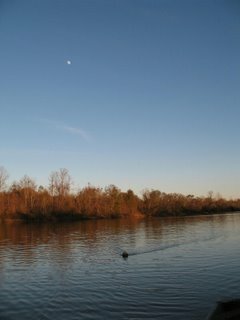 A few days ago the moon was up in the late afternoon. It looks friendly up there, even if a little out of place. The river is at 6.5 feet on the Butte La Rose gauge, falling slowly to 6.1 in a few days. The Ohio and Mississippi are both falling hard up north. It was a cold 33 degrees around 7:00 a.m. today. And if you had the courage to be out it that cold air, the sunrise this morning was hard to believe. Sometimes it is just so spectacular you wonder how our world can be put together in such breathtaking beauty. I looked at it in the clear cold air and tried hard to say that it was just a coincidence of ordinary things put together i n a most unordinary way. But somehow the sum of the parts was more than that, more than I could make it by listing the ingredients. There are trees, and sky, and clouds, and water, and sunbeams, and the sun itself – and together they seem to make a tunnel for us to look through, as Carolyn says to me tonight. They did that early this morning, and they will never do that in just the same way, ever again. Maybe that’s one of the really wonderful things about photography – it can make a record of what will never be real again. Like stepping in a river, the next time you try it, it will be a different river. And like that, once the moment in time passes, it never returns and neither does what happened in that moment. But we have a record of the sunrise this morning, and the moment is available for a repeat performance because of that. And I can share the sunrise this morning if I choose. Ain’t the world grand? Rusty and Lulu were out in the river raising nets this morning, in that very cold air over the cold water, traveling 30 miles per hour in that cold air between nets. I didn’t get to talk to them, but I could see the slicker coats being used to good effect. They are really good to break the wind. Sometimes I don’t envy what those guys do to make a living. It’s good for romanticizing, but not for the reality of it. At least not at my age. It is easy to notice the migratory birds that have reached here and are going about their winter duties in the yard. There are dark-eyed juncos, goldfinches, phoebes, white-throated and white-crowned sparrows and several others available for viewing every day. It’s hard to eat l unch without constantly looking out the window at the feeders behind the house. After picking out the meat, or most of it, I throw out the pan full of fragments of pecan shells, and the cardinals, sparrows and blue jays really go after the scraps. The second picture is the same sunrise this morning, just a little later and at a 2X magnification. The river is at 6.8 feet on the Butte La Rose gauge, falling to 5.4 feet by Monday. The Mississippi has a small rise that should get here next week, but the Ohio is falling hard and so no more water is expected very soon. 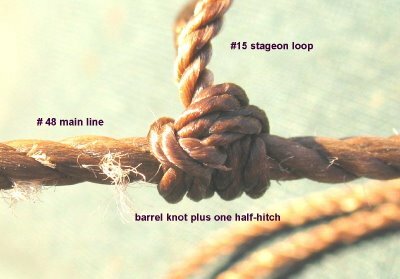 One of my friends, Randy by name, asked for a little more information on how the trotline is put together. I managed to get out on the river this afternoon (47 degrees) to bait the other 50 hooks that I had to abandon due to the high winds and rain yesterday afternoon. 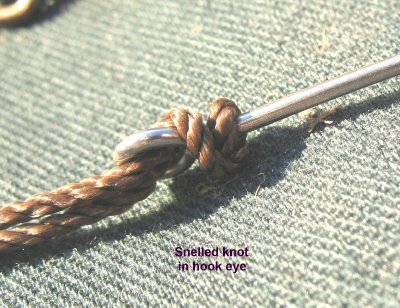 While out there I took the camera and just shot a couple quick images of the stageon I use and the way the knots are tied. The moon was up in the eastern sky at 4:30 and that’s a nice thing to see. I paddled all the way across the river so as to start there and bait the far half of the trotline, finishing in the middle so that I wouldn’t have as far to battle the current on the way back. When I got to the middle of the line, the last four hooks that I had baited yesterday had three fish on them. Now that is encouraging. I didn’t run the rest of the line, preferring to wait until tomorrow when the frog people (Louisiana Amphibian Monitoring Program) are here for the annual state meeting. Perhaps one or two of them will want to brave the cold temps to run the line themselves. I think there may be catfish to take home for anyone who wants some, or maybe there will only be those three fish I saw. Strange things happen under that water. My friend Larry Couvillier (“Catfish” to his friends) called today and offered me some white eels that he caught in Lake Fausse Pointe a couple weeks ago. I will try to accept his offer early next week. White eels, as we call them, are actually known by more bookish people as spotted worm eels. A lot isn’t known about the part of their lives spent in coastal lakes in Louisiana, but commercial line fishermen know them well enough to know that they are the best catfish bait there is in the fall months. I will get some from Larry and try them in the river. The river is at 7.1 feet on the Butte La Rose gauge, rising a little to 7.3 over the next few days. The Ohio and Mississippi are both falling, but a lot of rain fell up there (and ice too). We’ll see some of the that.